The new 2019 Ford F-350 rings is the third installment in the third Super Duty generation that was released by Ford back in 2017. Even though the generation is still pretty young, Ford has been keeping up with the times by making the F-350 as advanced as possible. With a new stereo system and Lariat Sport Package available, Ford has shown that it is focused on forward momentum with the well-loved F-350. Since the new generation was just introduced in 2017, not a whole lot is new on the 2019 Ford F-350. However, Ford has given this year's line-up a B & O sound system, replacing the outgoing model's Sony audio setup. Additionally, there is a new package available exclusively for the Lariat trim level called the Lariat Sport Package. This package features a spray-in bed liner, black body trim, and upgraded 20-inch wheels. Otherwise, almost everything carries over from the 2018 line-up. No matter which cab configuration you decide to go with, there is plenty of space to be found in the 2019 Ford F-350. Up front, the driver and passenger will find that there is more than enough head, shoulder, hip, and leg room. In the rear, passengers will be just as comfortable in the wide seats. Nobody will end up bumping shoulders or hitting their heads on the ceiling, and front seat passengers can feel free to recline their seats without infringing on rear seat space. A huge selling point for the new Ford F-350 is its impressive payload capacity, which is one of the best in its class. The F-350 offers a payload capacity ranging between 3,761 and 7,027 pounds. This makes it easy to load the truck with passengers and bulky items, which there is plenty of space for in the regular bed size. Again, another huge selling point for the 2019 Ford F-350 is the massive towing capacity. Once more, this turns out to be a best-in-class number. Depending on how you equip and configure this truck, it can tow a maximum of 32,000 pounds (with a maximum conventional towing capacity of 21,000 pounds, which tops other vehicles in this segment). Also, you can program the truck to recall the blind-spot settings and brake gains of specific trailers. There are extended mirrors on the side of the F-350 that help improve visibility of the trailer. While the standard gas-powered 6.2-L V8 engine does a fine job of powering the F-350, the diesel-powered 6.7-L turbocharged V8 is the option that really stands out. This engine is capable of generating a massive 450 hp and 935 lb-ft of torque, providing plenty of power to the vehicle. Paired with a 6-speed automatic transmission, the diesel engine is able to provide a smooth ride whether the truck is laden or unladen. 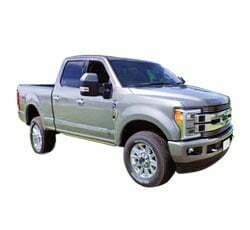 For being such a huge truck, the 2019 Ford F-350 is able to be nimble on its feet thanks to the fact that it has a lightweight aluminum body. This lightweight design allows the Ford F-350 to better navigate difficult turns while driving through town and get up to highway speeds a lot more efficiently. With the help of adaptive steering when weight is added to the front end (like while taking corners), the F-350 provides more feedback to the driver. Thanks to its lightweight design and strong powertrain, the Ford F-350 has no problem getting up to speed on the highway. While the 6.7-L turbodiesel engine does offer a brief moment of hesitation (which is characteristic of this type of engine), when it punches it, the torque really gets the truck moving. Also, acceleration rates feel steady regardless of whether you are towing a trailer, simply hauling your family around town, or going out on an exciting off-road adventure. Pairing the 6-speed automatic transmission with either the 6.2-L V8 or 6.7-L turbodiesel V8 will give you a nice, smooth, and comfortable ride in the 2019 Ford F-350. This transmission is able to upshift without effort, and downshifting feels just as fluid and natural. When you are towing a heavy load on the F-350, switching to tow-haul mode will help in smoothing out the abundance of shifts that can happen. The Ford F-350 is more than capable of functioning as an off-roading vehicle. Equipping the F-350 with the optional FX4 Off-Roading Package gives you electronic locking rear differentials (which improves traction in the rear wheels), shock absorbers specifically tuned for off-roading, hill descent control, skid plates, and, of course, the special FX4 decal. Additionally, this package comes with a 360-degree surround-view camera that allows the driver to see the trail on a split-view display screen. A lot of auto manufacturers have struggled in recent years to produce really refined and easy-to-use infotainment systems. Ford has nailed it this year with the Sync 3 infotainment system. Sync 3 is user-friendly but still manages to be high-tech with its numerous functions, including 911 Assist, Sirius XM radio, hands-free calling, and WiFi hot spot connection (which includes automatic updates for the system). The 2019 Ford F-350 has quite the lengthy list of driver aids available to help make each ride a lot safer. Equipping the optional adaptive cruise control aid is a smart idea for anyone who plans on using the truck to do a lot of towing. This feature helps by letting you know when you are going beyond the towing speed limit and aids in adjusting to the appropriate speed. One of the negative marks that the 2019 Ford F-350 gets is for its sub-par handling capabilities. While handling is not awful (and has issues typical for such a huge vehicle), hitting large bumps in the road will cause some noticeable disruption to the truck's chassis. Smaller bumps are generally not an issue, but while the truck is mid-corner, some of those harder bumps will feel pretty rough. Otherwise, you should expect a pretty solid driving performance from the F-350. The F-350 has a lot of nifty optional packages and stand-alone features that are tempting to add to the overall configuration. But proceed with caution if you are on a tight budget. These options get expensive quite quickly and might not end up being truly essential to your overall driving experience. If you pick one of the mid-level trims (such as the Lariat or the King Ranch), you can get a lot of desirable features rolled into the overall price tag for the vehicle. This is one of the problems that comes with the territory of driving a heavy duty truck like the 2019 Ford F-350. No matter how you swing it, visibility (especially to the rear) will be rather restricted. Expect to get plenty of blind-spots and come to rely on the blind-spot monitoring system to help you out. Unfortunately, the blind spot indicators that come with this system range on the small side. It is still worth it to use the system since the tall roof line and bulky rear roof pillars do a lot to obstruct the rear view. This is just a minor gripe, but it is something that many drivers will notice. At first, the brakes on the Ford F-350 seem somewhat disconnected and stiff. Of course, as you drive, the brakes will soften up a bit and start to feel more natural. You can apply a lot of force to them, and the brakes will respond accordingly. They just take some breaking-in. The 2019 Ram 3500 has a lot to offer that keeps it in competition with the F-350. These two trucks are similarly priced, but the Ram 3500 has a 6-cylinder diesel engine that just is not as swift as either V8 that you can equip on the F-350. It does manage to produce a good amount of torque with the aid of the automatic transmission. Also, the Ram 3500 has a cabin that is comparable to the F-350's in terms of spaciousness and comfort. Another top competitor for the 2019 Ford F-350 is the new 2019 Chevrolet Silverado 3500HD. While the Silverado 3500HD does tend to price a little bit higher than the F-350, it offers an impressive design quality and has payload and towing capacities that rival those on the F-350. However, the Silverado 3500HD has a much firmer ride quality than the F-350 and does not pack as much comfort into its seats. It also suffers from limited rear visibility. The 2019 Ford F-350 is a powerful heavy duty truck that works well as either a work truck or a family vehicle. Whatever you need it to do, the F-350 can get it done. While there are a few issues that Ford should try to smooth out, the overall driving performance is enjoyably strong.